Aspens are trees of the willow family (Salicaceae) and comprise one group (section) of the poplar genus—Populus section Populus—with six species. 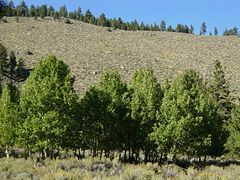 The poplar genus, which is generally divided into six sections includes the cottonwoods and poplars as well, all of which sometimes are called poplars. As with the poplars, aspens are deciduous, and their leaves turn bright colors before they fall. Like many poplars, the leaves have laterally flattened stems, so the breezes easily cause the leaves to wobble back and forth, giving the whole tree a "twinkling" appearance in a breeze. Aspens add ecological value as habitats and/or food for insects, birds, beavers, and so forth, and commercial value for producing a variety of products for humans, including matchsticks, furniture parts, tongue depressors, and ice cream sticks. However, aspens also create an aesthetic value for people, touching upon the human internal nature, with the beauty of their unique quivering movement of leaves and the rich fall colors adding to the enjoyment of nature. There are six species in the section, one of them atypical, and one hybrid. Aspens are all medium-sized deciduous trees reaching ten to 20 meters tall, sometimes even 30 meters. Aspens (apart from the aberrant White Poplar) are distinguished by their nearly round leaves on mature trees, four to 12 centimeters in diameter with irregular rounded teeth. They are carried on strongly flattened leaf stems, which enable the leaves to twist and flutter in the slightest of breezes. The juvenile leaves on young seedlings and root sprouts differ markedly from the adult leaves, being nearly triangular, showing here the typical leaf shape of most other poplars. These leafs often are much larger also, being ten to 20 cm long. The five typical aspens are distinguished from each other by leaf size and the size and spacing of the teeth on the adult leaves. White Poplar leaves differ in being deeply five-lobed, covered in thick white down, and having only a slightly flattened leaf stem. 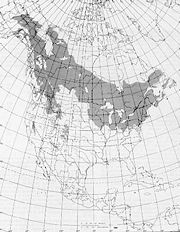 Aspen trees have the widest distribution of any native tree species in North America, and worldwide—the only trees with wider natural ranges are Populus tremula (European aspen) and Pinus sylvestris (Scotch pine) (Nix 2007). The five typical aspens are all native to cold regions with cool summers, in the far north of the Northern Hemisphere, extending south only at high altitudes in mountains, although quaking aspen is found in the mountains of Mexico (Nix 2007). Populus Alba (white poplar) by contrast is native to much warmer regions, with hot, dry summers, and is native to Africa and Asia. Populus tremloides or quaking aspen, is considered to be the most widely distributed species of tree in North America, extending from from Newfoundland and Labrador west across Canada to Alaska, from Minnesota to New Jersey, and through the western United States to the mountains of northern Mexico (Rook 2002). Aspens are dioecious (trees are either male or female). Aspens typically flower in March and April, prior to the appearance of the leaves (TL 2007). Both male and female trees produce catkins (slim, cylindrical flower clusters), with female catkins, after pollination, ripening in early summer, releasing tiny sees (TL 2007). Aspen's main reproductive method, however, is vegetative, with new suckers or ramets (vascular bundles, the intra-net system of plants), growing off the roots of mature trees (TL 2007). This method can be very prolific, with numerous new shoots produced, particularly after a major disturbance such as fire (TL 2007). All the aspens (including White Poplar) typically grow in large colonies derived from a single seedling, and spreading by means of root suckers; new stems in the colony may appear at up to 30–40 m from the parent tree. Each tree only lives for 20–150 years, depending upon the species. Aspen has an extensive root system (TL 2007). Although trees live less than 150 years, the root system of the colony, on the other hand is long-lived, in some cases for many thousands of years, sending up new trunks as the older trunks die off above ground. One such colony in Utah (United States), given the nickname of "Pando," is claimed to be 80,000 years old, making it possibly the oldest living colony. Some aspen colonies become very large with time, spreading about a meter per year, eventually covering many hectares. They are able to survive intense forest fires as the roots are below the heat of the fire, with new sprouts growing after the fire is out. However, aspens do not thrive very well in the shade, and it is difficult for aspen seedlings to grow in an already mature aspen stand. Fire indirectly benefits aspen trees, as it allows the saplings to flourish in open sunlight on account of the burned landscape. Lately, aspen has increased its popularity in forestry, mostly because of its fast growth rate and ability to regenerate from sprouts, which makes the regeneration of the forest after harvesting much cheaper, as no planting or sowing is required. Aspen wood is white, and soft, but fairly strong, and with very low flammability. It has a number of uses, notably for making matches, where its low flammability makes it safer to use (easy to blow out) than most other woods. It is commonly used in pulp products (such as newsprint and books), insulation board, particleboard, and is preferred for structural flakeboard, as well as is good for furniture parts, pallets, interior trim, paneling, ice cream sticks, tongue depressors, and toys (Rook 2002). Heat treated aspen is a popular material for the interiors of a sauna. Shredded aspen wood is also a popular animal bedding, as it lacks the phenols associated with pine and juniper, which are thought to cause respiratory ailments in some animals. As a commercial wood product, it has been of low demand, but its commercial value has been increasing in recent years (Rook 2002). The aspen tree's quivering leaves are, in Christian lore, said to be the result of arrogance at the Crucifixion because the aspen did not tremble like other trees. A German version claims that the aspen was the only tree to refuse to acknowledge the divinity of Jesus. The cross that Christ was crucified on is sometimes said to have been aspen wood. Emigrant Basque shepherds in the nineteenth and twentieth century carved texts and figures on aspens of the American Southwest to express their loneliness. Barnes, B. V. “The clonal growth habit of American aspens.” Ecology 47: 439-447, 1966. Nix, S. Aspen tree: One of the 100 most common North American trees About.inc, The New York Times Company, 2007. Retrieved August 17, 2007. Rook, E. J. S. Populas tremuloides: Quaking aspen Rook.org, 2002. Retrieved August 17, 2007. Trees for Life. Species profile: Aspen Treesforlife.com, 2007. Retrieved August 17, 2007. This page was last modified on 20 April 2016, at 19:59.